For maximum freshness, please keep seed refrigerated in its original packaging until it is time to plant. Sow seed in containers in a coldframe in spring. 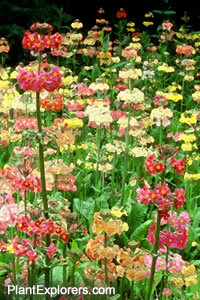 Grow on in any moderately fertile damp soil. A good plant for those gardens that don't drain particularly well. <br>Please note that these plants are open pollinated and show considerable variation. Avoid the temptation to 'weed out' the smaller seedlings, as they often produce some of the more striking flower colours. Grow in rich moist acidic loam in full sun to part shade.